Saving Species Record numbers of breeding avocets revealed in a new report on the UK’s rare breeding birds. Record numbers of breeding avocets revealed in a new report on the UK’s rare breeding birds. A guest blog from Mark Holling, secretary of the Rare Breeding Birds Panel. The latest annual report from the Rare Breeding Birds Panel (RBBP) reveals that there were at least 2,230 breeding pairs of Avocets in the UK in 2016. This is the first time since the species (the emblem of the RSPB since 1970) recolonised the country in the 1940s that over 2,000 pairs have nested. All but one of the 112 breeding sites were in England, from Somerset in the south-west to Northumberland in the north-east. The sole Welsh colony is at the RSPB reserve at Newport Wetlands in Gwent. Avocets had never been recorded nesting in Scotland until this year, 2018, when a pair bred at the RSPB reserve at Skinflats, near Grangemouth. Other species which posted their highest ever annual totals since the Rare Breeding Birds Panel first started reporting (1973) include Mediterranean Gull, Cetti’s Warbler and Little Egret. These three species have been spreading north and west since colonising the UK in the 1960s, 1970s and 1990s respectively. All have likely benefitted from milder winters and the provision of new wetlands. Two birds of prey, Osprey and Goshawk, were also recorded at their highest ever totals. Strengthened protection of these raptors has helped them spread into new areas, although the Goshawk, along with a number of other species of birds of prey, continues to suffer from illegal persecution in some parts of its range. Cirl Buntings were the subject of a national survey in 2016 and they have reached their highest numbers in many decades, an estimated 1,079 territories, all in Devon and Cornwall, the result of years of partnership work between farmers and conservationists to bring this species back from the brink of extinction. Not all species are doing quite so well. For the first time since the Panel was set up in the early 1970s, no records of breeding Golden Orioles or Red-backed Shrikes were received. National surveys of Capercaillie and Hen Harrier confirmed the declines in the numbers of these species. The UK’s rarest breeding raptor, the Montagu’s Harrier, was found at only six sites, a continuing decline for this species and the lowest total since 1984. Montagu’s Harriers are confined to small areas of southern England where they nest in arable crops. Each nest is watched over and protected by conservationists who work closely with farmers to ensure areas containing nests are not harvested until after young harriers have fledged. There were two particularly unusual events in 2016. 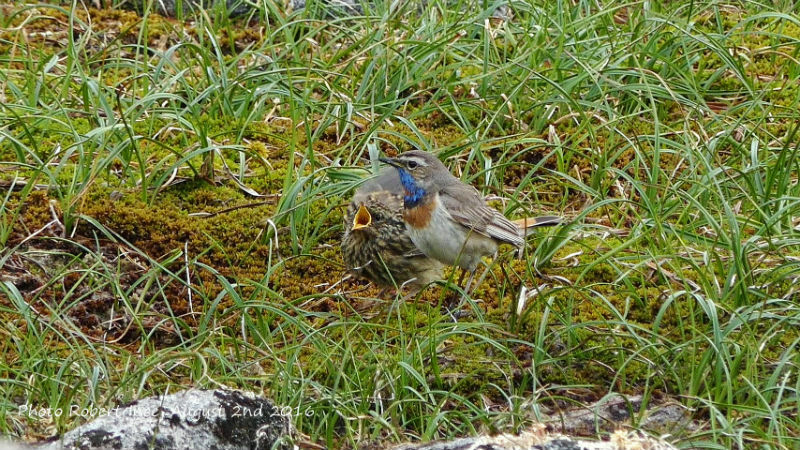 A pair of Red-spotted Bluethroats was found breeding in highland Scotland, in habitat highly untypical for this species – a treeless stony area high in the mountains. Also in Scotland, a pair of Little Gulls fledged two young from the RSPB reserve of Loch of Strathbeg in Aberdeenshire. This is the first recorded successful breeding by Little Gulls in the UK. The report ‘Rare Breeding Birds in the UK in 2016’, compiled by the Rare Breeding Birds Panel (RBBP), is published in the monthly journal British Birds. Each year the RBBP collates and analyses data on over 100 rare breeding bird species. As well as the report, the RBBP maintains the definitive database of rare breeding birds including numbers and sites. The RBBP is financially supported by the RSPB, JNCC (on behalf of the devolved government conservation agencies Natural England, Scottish Natural Heritage, Natural Resources Wales and the Department of the Environment (Northern Ireland)) and the BTO. Further information can be obtained from the Secretary of the Rare Breeding Birds Panel at secretary@rbbp.org.uk.